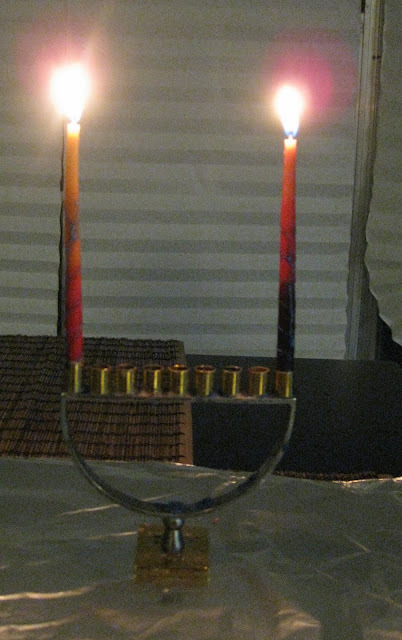 Nerds In Love: Happy Hannukah! Tonight is the first of the 8 nights of Hannukah. While off in Virginia celebrating Christmas with my awesome (non-Jewish) boyfriend and then holding down the fort in Mission Control, I'll also be celebrating Hannukah by lighting candles every night. Since one of the main obligations of Hannukah is publicizing the miracle (putting your Menorah in the window, lighting them in public squares, etc) I'll post one Hannukah FAQ/factoid each night. Q: Whats all Hannukah about? If you have any Hannukah questions, send them my way (add a comment, tweet me, email me) and I'll add your answer to a future night. Happy Hannukah! I have a hard time getting through one holiday. Two might kill me. What I made Wednesday- Baking up a storm!